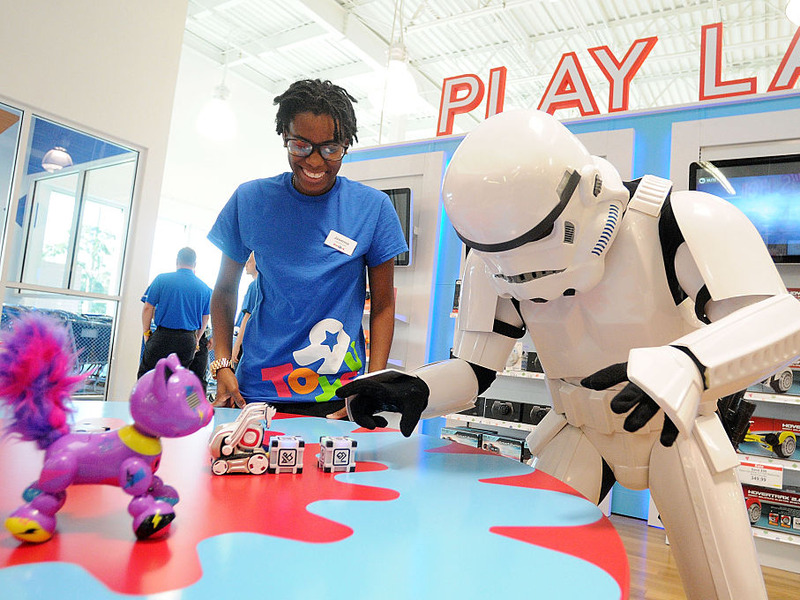 Getty ImagesA Toys R Us store in Brandon, Florida, celebrates its grand opening on October 29, 2016. Toys R Us locations are slashing prices on Apple products as the retailer prepares to shutter or sell all its US locations, AppleInsider reported. One person on Reddit said they got an AppleTV at Toys R Us for $US75, while Apple is charging $US149 for the device. Toys R Us announced plans last week to close or sell all 735 of its remaining US locations. Toys R Us is slashing prices on Apple products as it prepares to shutter or sell all its US stores. Some Toys R Us locations have already started discounting Apple products, AppleInsider reported Friday. The trade publication said it called five stores and found that four of them were doing so. One person on Reddit said they got an Apple TV from Toys R Us for $US75, while Apple is charging $US149 for the device. They also said they got a $US54 iPod Nano, a product no longer sold by Apple that typically costs about $US145 from third-party retailers. Toys R Us told employees on Wednesday that it planned to close or sell all 735 of its remaining US stores, beginning an “orderly wind-down” of operations. Early the next day, it filed a motion to liquidate its US business. The company recently started clearance sales at about 170 stores that it plans to close in April. Experts told Business Insider that customers could expect to see blowout clearance sales across the country in the coming weeks. “Toys R Us is not going to want to drag this out,” Corali Lopez-Castro, a bankruptcy lawyer and managing partner at Kozyak Tropin and Throckmorton, told Business Insider before Toys R Us filed its liquidation papers. Toys R Us has struggled to compete with rivals such as Walmart, Target, and Amazon in recent years. And the company had been saddled with debt following a $US6.6 billion leveraged buyout in 2005.